There are two people in Florence who contribute to my life in so many ways! 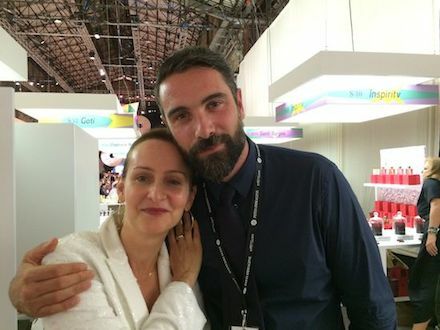 They are Roberto Ruta and Lisa Chiari, two exceptional human beings who have enlightened me, from film to fashion to fragrances. I’ve never met anyone like them, and I vouch for it right now, will never again. From Pitti Uomo and Pitti Fragranze, which they’ve introduced me to thus rekindling within me a passion for menswear and perfumes to the Middle East Now festival, a yearly event truly helping the dialogue between the Middle East and the West, these two would be my nomination for a Nobel Peace Prize. But enough gushing, here is the intro to a piece for the latest wonder I’ve discovered, thanks to them: Pitti Fragranze. Read up on “Scent of a Man”– two companies and one scent connoisseur, Chandler Burr, that are changing the way we “look” at perfume today — and a fascinatingly scent-astic profile of actor Luca Calvani, which I titled “The Perfume Affair” both on the Huffington Post. And in case you need a visual prompt to entice you to the latter, well, here it is. Yes, I like my job. A LOT. This entry was posted on Saturday, October 10th, 2015 at 7:24 am and is filed under Adventures, Interviews, Man's Opinion, The List, Woman About Town.